A Nixon masked serial killer gets his hands on a song that turns all who hear it into ultra violent zombies. He manages to play the song at a local metal gig thus turning a fun night into carnage and starting the ball rolling to spread the infection. Alana (Rebecca Torrellas) and Tony (Todd Jason Cook) along with their fellow band mates battle against zombies which leads them to discover the killer in the Nixon mask, but who is he and why is he able to control the zombies?? Lucky for them their friends Angel (Kathryn René Ginzel) and Tommy (Mike Gebbie) had encountered this musical zombie virus some thirteen years previous and know of a way to stop it which leaves them with the problem of dealing with the mysterious killer. 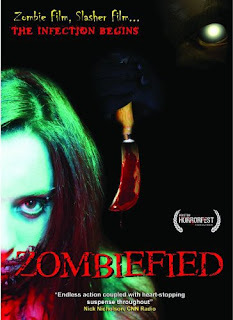 Combining zombie and slasher traits together has produced a relatively fun watch with an interesting twist but unfortunately there is a lot going against this to make it a "good" movie. Very low budget with a host of flaws this isn't great but it does have numerous fun and messy moments. The zombies are the viral type so not undead, they are easily immobilized and do not infect others by biting them however they do enjoy feasting on human flesh. Their make up is not very elaborate at all but there is a lot of blood, gore and intestinal munching all done through the use of some pretty good practical effects. The sound is an issue though. Choosing to play an incredibly tinny sounding thrash metal track over all the action scenes was a good thought but it needed a ton of bass or general equalization to be effective and was so low in the mix you can hear everything else that's going on it does nothing to enhance the action at all. They don't seem to have had the same trouble with the incidental music which seems well balanced compared to the featured tracks. Character and script wise it's fairly weak with a lot of clichés and wooden acting from all involved. Lots of the usual horror character deliberate errors such as running straight into noisy herds of zombies, never closing a single door and leaving before checking the bad guy is truly dead. Not to mention some classic dialogue such as... "Boy, there ain't no such things as zombies" and classy chat up lines like " those are some bitchin' legs... how long are they open? ". I know right? I can see your eyes rolling from here! With a runtime of an hour and forty-five minutes this could have been cut down considerably if they had left out several scenes of people wandering aimlessly about and having some rather bland and pointless conversations but I will reiterate that the scenes of mass zombie hoarding, devouring of guts and general kills were really fun to watch. I always enjoy the use of live music in movies even if in this case it's not exactly quality or priority it's still good to see. They brought something different to the mix by adding the serial killer element too so on the whole it's not a bad watch, can't say I would watch it again but I'm not disappointed that I gave it a go.